The Fabulist: Happy Female Literacy Day! 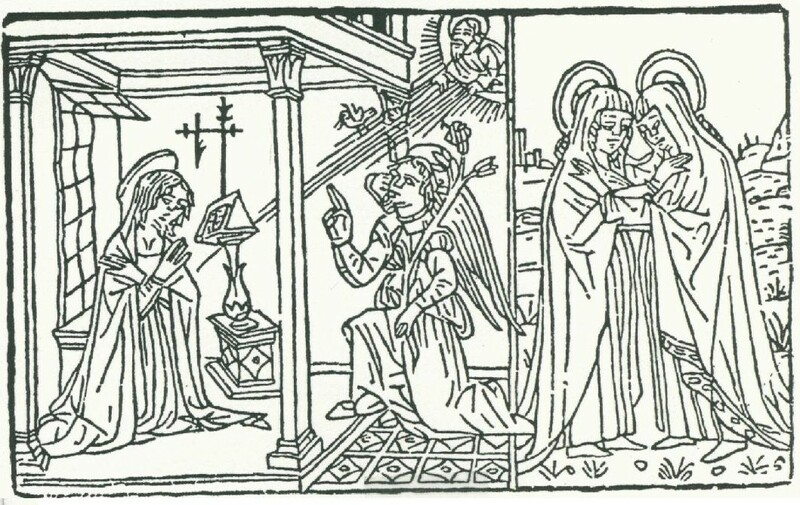 Annunciation of Jacquelin de Montlucon, late 15th century. Today in the Anglican and Catholic churches is the feast of the Annunciation, which wins for best art ever, or at the least wins the numbers game. There are probably more Annunciations out there than any other religious subject, because the drama of the angel Gabriel intruding on a startled (yet piously reading!) Mary to give her the good news of Jesus' birth has proved an irresistible subject for just about every major European artist since the invention of dirt, or at any rate Christianity. None of these paintings ever show Mary doing anything less pious or remotely ordinary; she's never surprised while doing the laundry, or eating falafel. The Annunciation got the artistic wing-up on other subjects because it was understood as the beginning story of Christianity, and so it usually got depicted as the first illustration in medieval Books of Hours. It's a common misconception that these books were always gorgeously illuminated, impossibly expensive prayer books for the very rich, and it's true that some of them were. But many more, especially after printing got going, were mass-market, cheaply-produced factory products, and in book-obsessed England, just about everyone had one, from the scullery maid to the King. Even the non-Latin literate owned copies of this book, because first of all when you hear prayers every single day of your life you come to understand them inside and out, even if you don't know the finer points of grammar (ask any Jew who's ever failed out of Hebrew school but knows every word of Unetaneh Tokef.) And secondly, the books had plenty of pictures to prompt both your memory and your devotion. For the wealthy, these would be hand-illuminated, richly decorated pictures of sometimes extraordinary quality. For you and me, the pictures would be prints of woodcuts, often with some red color daubed on at the bookbinders, if you felt like paying the extra coin for that. But the Annunciation would have had pride of place in both high-end and low-end copies, right at the beginning of the book. This decidedly up-market illo is from the 15th century Bridewell Hours, made for an English buyer. The text underneath is the opening lines of the first Hour of the day: Domine, labia mea aperies, et os meum annuntiabit laudem tuam (Lord, open thou my lips, and my mouth shall show forth thy praise.) 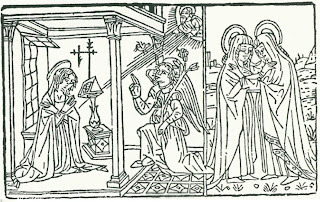 The verb "annuntiabit" connects the text to the picture, so that just as the angel announces the good news, so the reader announces his praise. 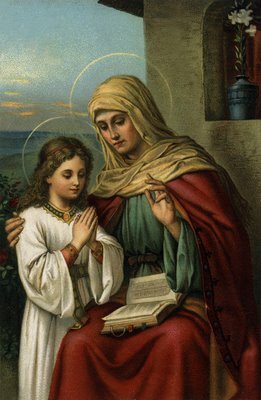 Thus the reader begins his prayers for the day where the Christian story begins, in a neat symmetry that allows the reader to feel not only connected to salvation history but inserted in it, since Mary herself is usually depicted anachronistically reading her morning prayers as well. This sense of the Annunciation as a new beginning isn't just in the visual arts, as Tolkien geeks will be well aware. It isn't accident that has Frodo casting the ring into Mount Doom, vanquishing evil, and ushering in the new golden age on the 25th of March, by Shire reckoning. * And in his Appendix, Tolkien says that this day became New Year's Day from that point on: the new beginning of the world. The uber-Catholic Tokien did not pick that date at random; it was picked for him, by centuries of Christian devotion to Lady Day, as this day was commonly known. Here is the El Cheapo version of a Book of Hours illo, in which you get the Visitation in a twofer. What's interesting about this poem, besides its heart-stopping beauty and exploration of paradox, is what it reveals of Donne's Catholic sympathies. Donne was born a Catholic in anti-Catholic Elizabethan England, and even when he left his native faith for the path of preferment and eventual prosperity, he retained much of that faith's architecture, which is always peeping out at the corners in his writing. For instance, check out line five in the heart of the sonnet above: in affirming the sinlessness not only of Jesus, but of the Virgin Mary (he there can take no sin, nor thou give,) Donne neatly articulates the doctrine of the Immaculate Conception, a belief not held as binding on Catholics until 200 years later, but commonly held as a matter of devotion among pious Catholics for centuries. Belief in Mary's sinlessness from the first moment of her conception was, of course, firmly rejected by the European Reformers, because it was thought to undercut Jesus' work of salvation by implying Mary got some kind of special pass. Donne got away with this kind of thing because well, he was Donne, but also because lots of Englishmen, even into the latter part of the 16th century and beyond, shared his sympathies. The rejection of Catholicism in England was a political maneuver by government elites for reasons of state, and Reformed Christianity remained deeply unpopular among the people, who for many years were loth to surrender their rosary beads, their blessed candles, their devotion to beloved saints and their shrines, and yes, their precious Books of Hours. Protestantism really didn't get thoroughly beat into the people's heads until the 18th century, and even then Catholic tendencies kept cropping up in the oddest places, so that the government authorities were constantly playing theological whack-a-mole. Eventually English Catholicism erupted with a vengeance in the 19th-century Oxford Movement, and today much of what goes on in Anglican parishes would make Cranmer weep snot-filled tears. Beauty is hard to kill. One of the most stunning works of art to come out of the English Late Medieval period is the Memling altarpiece, painted by Flemish artist Hans Memling for Yorkist apparatchik Sir John Donne, collateral relative of John Donne the poet. Take a look at the books Lady Donne and the Virgin are holding: for Lady Donne, her Book of Hours, and for the Virgin, a breviary. 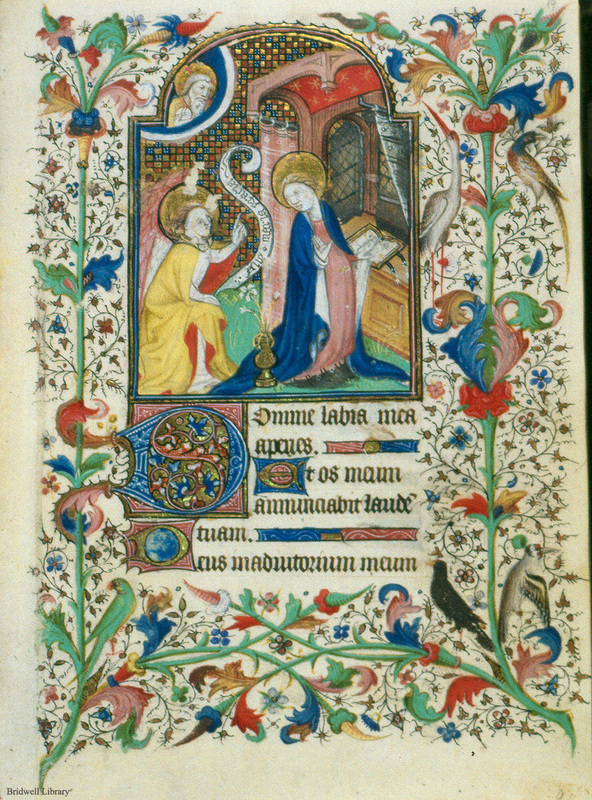 (The double columns of the Virgin's book are characteristic of the breviary, which is just the fuller, multi-volume version of the single-volume Book of Hours.) It's an interesting commentary on female literacy and piety that it's the women who are shown reading their prayers; St. Margaret's sword directly behind him associates Sir John with action rather than reading. Depictions of the Annunciation and the reading Virgin primed audiences to associate women and reading, and in Western art the most common depiction of St. Anne, mother of the Virgin, show her teaching her daughter to read from her prayer-book. For millennia the passing on of basic literacy has been understood as "women's work," and before you dismiss that as outdated, go to your local elementary school and count the number of male teachers there. 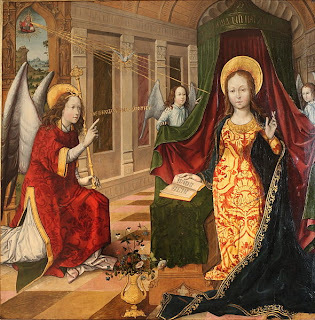 The point to be made is that even as Western society continued to disenfranchise, sideline, and subjugate women, it consistently exalted female piety as a kind of ideal or model — and depictions of the Annunciation are both a reflection and a cause of that respect for feminine devotion. There's a good argument to be made that that respect was the groundwork for all later advances in women's equality. So, in honor of Lady Day, no matter your religious persuasion, go read a good book. And if you know how to read, chances are there is a mother or a female kindergarten teacher to thank for that. Give them a call and thank them today; go ahead, make Frodo proud. And Happy New Year! *In case you were wondering, yes, I know today is not the 25th of March. But should it fall during Holy Week, among Western Christians the feast of the Annunciation gets displaced to the first Monday after Easter Week, so the Virgin got bumped this year to the 8th of April. The date of the Annunciation is arbitrary anyway, based on the establishment of December 25th as the celebration of the birth of Jesus — thus making Mary the only woman in history to give birth on the exact date predicted. What a wonderful post. I half expect a sonnet on Cranmer's snot-filled tears. You know I am a big sucker for iconography, so I was enjoying another aspect of the Memling piece: The two Johns are in the same pose, and each is gesturing toward a symbol of Christ; one as the Lamb of God and the other in the Eucharist. This also leads me to my very favorite Annunciation, which highlights Mary's sinlessness. It was painted by Fra Angelico (I think there are more Annunciations in Florence than anywhere else), it hangs in the Prado. The painting is visually divided into three segments. Mary is on the right, Gabriel is in the middle, and on the left, we see Adam and Eve, clothed in sack-cloth, as they are expelled from the Garden of Eden. Up above the Original Sinners, the hand of the Almighty appears in a shower of gold to lob the Holy Spirit, in the form of a dove, directly at Mary. In other words, the conception of Christ passes over Original Sin.